Carol and Curt stayed by in London two days after Randy and I left for the United States. 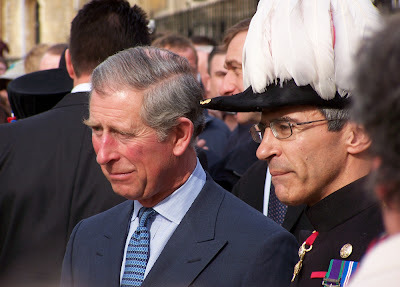 We had joked while we were there about seeing Prince Charles. Carol hadn't been back to the States for very long before I had a phone call. "Guess who we saw! We were so close we could touch him!" Yes, you guessed it . . . they saw Prince Charles. He was participating in an event they had chosen to see. Carol got several photos, this one was the best. We've been re-living our experience, over and over, as a DVD has been developed. It is finally finished. Copies of the DVD have been sent to donors who supported our project. "Normally I just flip through the chapters on a DVD," stated Viorel Catarama upon receiving his copy. "On this one, I had to see every minute, every second. Of course, the first part I experienced first hand. I had no idea what our team experienced after they left me in Dar es Salaam. What a trip!" While we were at the Twing Memorial School we saw the walls going up on an addition of five new classrooms. Here they are, the roof is on. 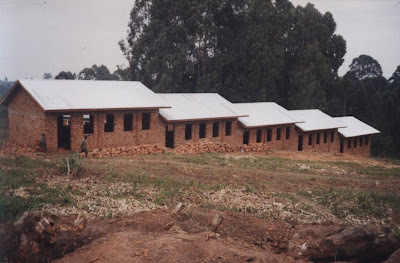 The new classrooms will accommodate the waiting list of more than 100 students. Imagine the embrace . . . it had been months since we all had seen Musa Mitekaro, our brother and guide in Africa. In July he came to the United States to represent Twing Association for Health and Education Development at our annual ASI meeting. Here we are at the booth promoting this special project. From left, Curt, Carol, Rachel, Randy. Oh, you want to see Musa! He was so busy we all were not in one spot at one time. Here he is visiting with someone who had stopped by.